Phase is a new product that uses wireless technology to enable you to play and scratch audio files using vinyl without a needle. French company MWM has created the gadget, which translates the movements of a record into the timecode format that can be read by Digital Vinyl System (DVS) software such as Traktor and Serato. You can use any vinyl to control Phase, and it plays digital files that are loaded via your DVS software, allowing users to play and scratch these files without a tonearm and without specialised timecode vinyl. 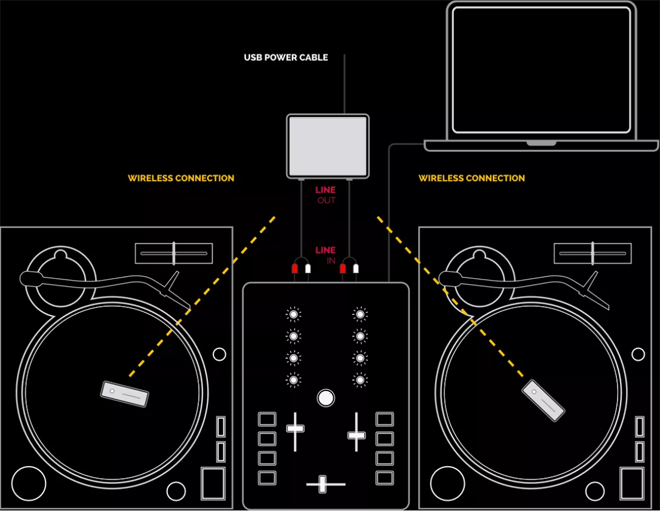 The Phase transmitter has an adhesive surface which can be affixed atop a record, and as the record plays Phase using sensors to track the movements and send the information to a receiver, which is linked to the DJ equipment and laptop running the DVS. The wireless technology means users don’t face the possibility of needle skips or records jumping from shaking surfaces. A light emitted from Phase acts as a sticker cue or rotation marker. Phase is compatible with any turntable, which, as well as fitting any record player setup you may have, makes it an easily portable option for club use. You can even lift the record off the platter and give it a spin on your finger for a particularly scratching scratching manoeuvre. MWM recently showcased the technology at the NAMM trade show with multiple demonstrations, and The Verge reports there was no perceivable latency with the technology, even when turntablists performed quick and complex movement. MVM says the battery life can last up to 10 hours on a full charge, and they’re already working on improving it. Release plans are scheduled for this summer, with the price expected to be around $300.